November was a busy month and the Sonoff Dual that IteadStudio kindly sent me to review was bored in a box waiting for some free time. But it was just fair that another board that has been waiting in the boards-to-review box for longer had it’s chance to have some fresh air too. So here we have the Itead Studio Sonoff Dual and the Electrodragon ESP Relay Board face to face. 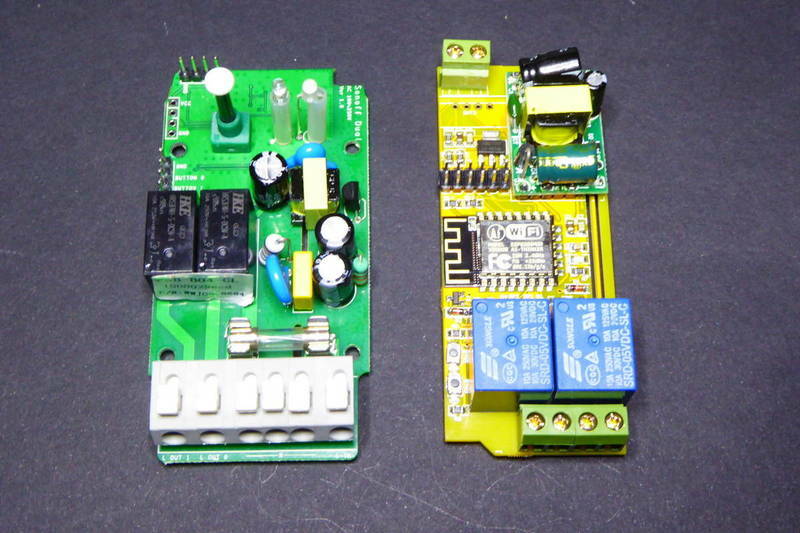 They are both two relay boards with an Espressif ESP8266 controller. They are both powered from mains and programmable. The both have a similar size. They might look alike but they are actually quite different from the inside. * Please note that even thou the Electrodragon has 10A relays the board itself is no way able to handle such currents. The manufacturer recommends a maximum of 1A per line or 2A on a single line. 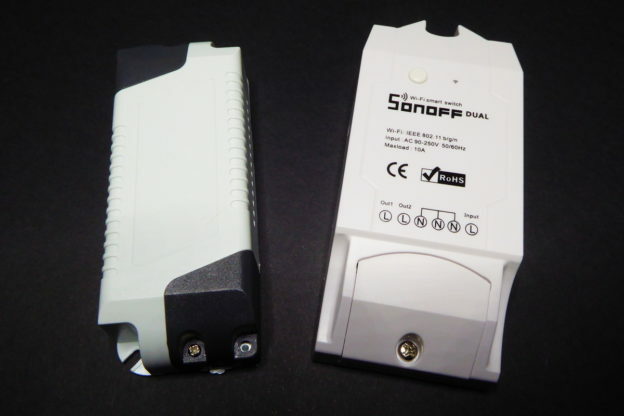 The Sonoff Dual is a more sturdy and end-user friendly device, it comes with a default firmware that connects to the eWeLink app for Android and iPhone and lets you manage the relays, configure schedules and much more. The Electrodragon on the other side is a hacker’s board, with a demo-firmware loaded which does very little. Anyway I wanted to load my ESPurna firmware on both of them. It might look easy and for the Electrodragon is just a matter of adding support for multiple GPIO driven relays, but not for the Sonoff Dual. The Dual has 2 LEDs and one button meant to be used/checked from outside the enclosure. But the button is not connected to the ESP8266 (so you cannot use it to set the IC in flash mode, more about this later). The approach IteadStudio have used is pretty much the same they have in their PSB-04 modules: encapsulate the button and relay functionality in a helper microcontroller, a Silicon Labs F330. When a button is pressed the F330 reports the new status of the relays to the ESP8266 through serial. The ESP8266 can also change the relays statuses sending the proper commands to the F330. 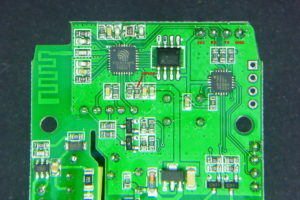 The on-board button in the Sonoff Dual reports being button 2. Buttons 0 and 1 are available in a header properly labelled. The protocol has been reverse engineered by Markus Maeder and published in Itead’s support pages here. The messages have 4 bytes: starting byte, number of relays, status mask and stop byte. So if the user presses the on board button (BUTTON2) the F330 will send 0xA00404A1 to the ESP8266 (provided everything was off). Bad news is that the communication is done through the hardware UART interface of the ESP8266 at 19230,8,N,1, so we cannot use it for debugging purposes. I have added support for the Sonoff Dual to my ESPurna firmware. You can check it out in the repo but I’d like to highlight here the two chunks of code responsible for the communication between the ESP8266 and the F330. Note some things in the code above. First we check for the message format (lines 23 to 26). Second we expect just one button to be pressed at a time so we break after a relay has changed it status (line 45). And third we intercept button2 presses and map them to button0 (line 33). So the external button toggles relay 0. Right now this is hardcoded, change it to “value = value ^ 2” to toggle relay 1 instead. The relayStatus method does quite a few things: checks if the status has changed (returns true if so), sends the message back to the F330, synchronises other devices (more about it in a minute) and sends notifications to MQTT and websocket clients. Since the button is not connected to the ESP8266 GPIO0 flashing the Sonoff Dual is a bit trickier than doing the same on the TH or POW. My recommendation is to shortcut an exposed pad connected to GPIO for the first flash and then use OTA to upload the filesystem or update the firmware. 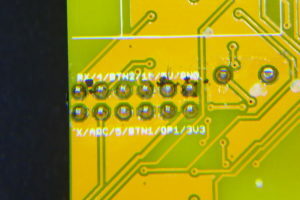 In the picture below you have a line pointing a resistor pad connected to GPIO0. Use a jumper cable to short it to ground while powering the board to get into flash mode. 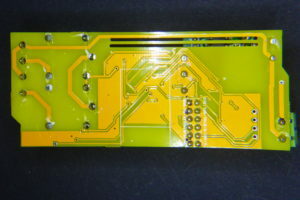 The Electrodragon board is relatively simple to use. It’s a board meant for developers, not for end-users. The relays are directly connected to GPIO12 and GPIO13 so it’s just a matter of handling different GPIOs in the code. I use a vector to store all defined relay pins and then directly drive them with digitalWrite method. To flash the Electrodragon note the pinout in the picture bellow. Power the device through the 5V pin. 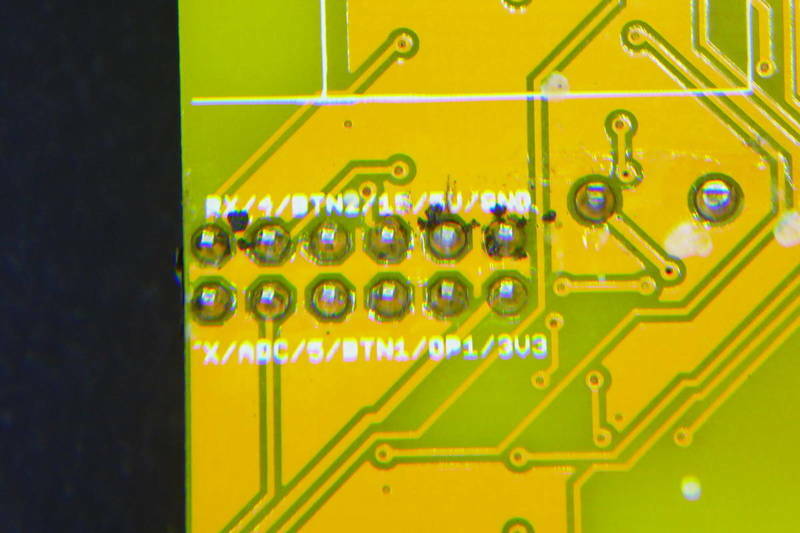 The RX marked pin should go to your programmer TX pin and the TX to the RX. Use the button labelled BTN2 to get into flashing mode. I’ve have better results holding it down while powering the board and until the firmware has started flashing. Let me stop in the “one and only one on” since this this allows for multi-way switching, which is something I’ve been after since the first Sonoff. This is a quite common way of switch where yo can toggle your lights from different switches in the room. A 3-way switch (like the one in the graphic) is usually implemented with a SPDT relay with exposed NO and NC terminals. 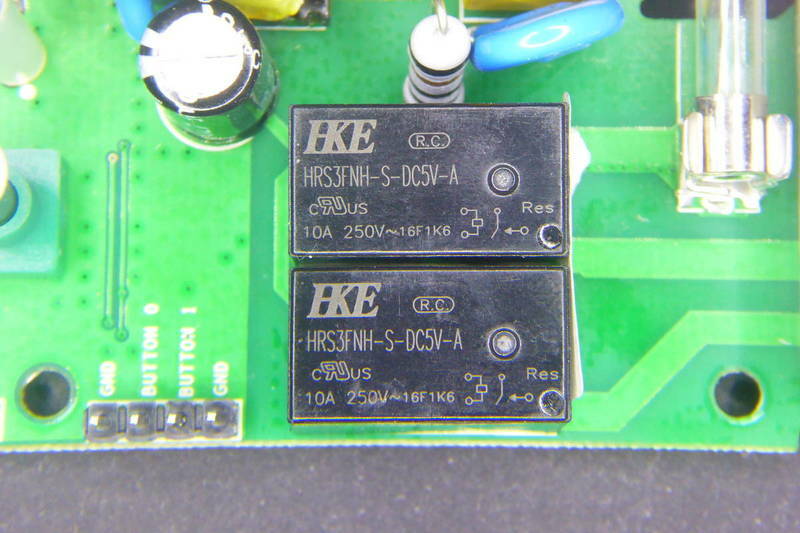 But you can also use two relays with inverse sinchonisation, like the “one and only one on” mode does. I have also removed deprecated API entry points so all API requests go trough the /api namespace and require and API key. I plan to add more API entry points to retrieve sensor values and a “pulse” mode for the relays so they can auto off after a second. 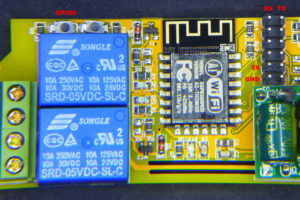 ESP8266 Multi-relay boards: Sonoff Dual and Electrodragon by Tinkerman is licensed under a Creative Commons Attribution-ShareAlike 4.0 International License. This entry was posted in Analysis, Code, Projects and tagged electrodragon, esp8266, espurna, itead, relay, sonoff, sonoff dual on December 7, 2016 by Xose Pérez. Very interesting – I agree with comments about both boards – I don’t like the quality of the Electrodragon – Itead stuff is WAY better. I use the original SONOFF to control 2 small heaters and have done for months without any issue. Also of interest, your software – I was not even aware of it – am now – will test it and blog about it at http://tech.scargill.net where there is LOTS of ESP8266/Alexa/Sonoff stuff. So – anyone wanting to blow software for these can look at my own software for ESP8266 which has support for these boards – but not Alexa support – as I’m starting to use very similar software to yours by the look of it – are you aware of this one which now has dual access point support (my suggestion though I’m sure others suggested it too) and of course MQTT and Alexa support. I’ve just noticed yours has up to 3 access points – good idea – right – I’m off to try it out on one of my Sonoffs. Yes I follow your blog. Great stuff there. I’m aware of your work and Theo’s too. His firmware is very much like mine albeit more evolved and with a lot of options. He has been working hard lately adding support for POW, DUAL and Alexa too. ESPurna has become the synthesis of different ESP8266 projects I’m working on. Whenever I improve something on any of them (like Wifi connectivity or using Hristo’s async libraries) ESPurna gets an update too. In 2016 we are still woking on the NEST support and linkage : ) Using the NEST temperature, humidity and light intensity information to automatic control the sonoff should be a good application. So, are you part of the eWeLink/Sonoff developer team? If so, great to know what’s in your roadmap. I’m one of those user that prefer to go cloud-less if possible. I think that you don’t really own the device if you don’t own the data. Open sourcing the code would be great. Open sourcing the API could be a first step. ESPurna by emulating a Belkin WeMo switch. But for sonoff we will try to connect the cloud server to Alexa, Echo command to the server then our server send the action command to sonoff (sonoff don’t care this command is from app or Echo, it just do what sever tell it to do) – in this way we don’t need to modify the firmware but just need to upgrade the server code. Can do it now with this code and that of Theo. Got several Sonoffs around the house all responding to Alexa. Do you know something about this board? 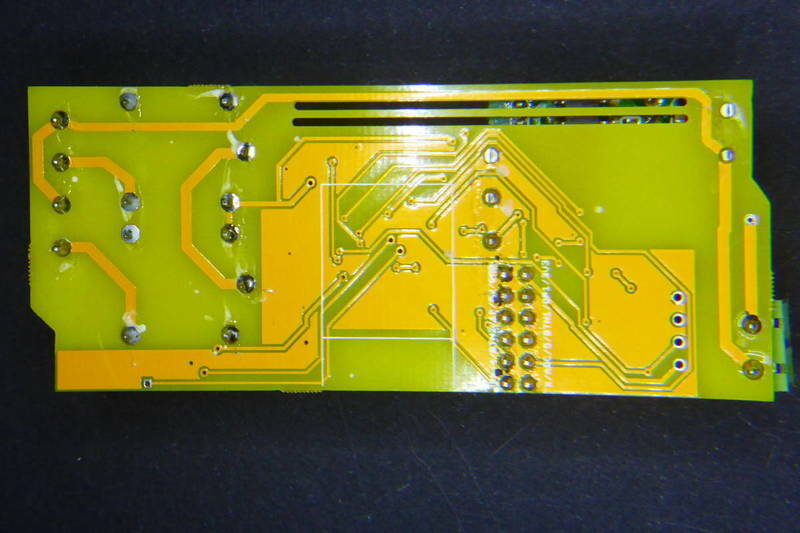 That’s the Electrodragon board I use in the example, but version 1.5. Mine is version 1.0. It should work with the current Espurna firmware selecting the Electrodragon hardware. Thanks! I will give it a try !!! 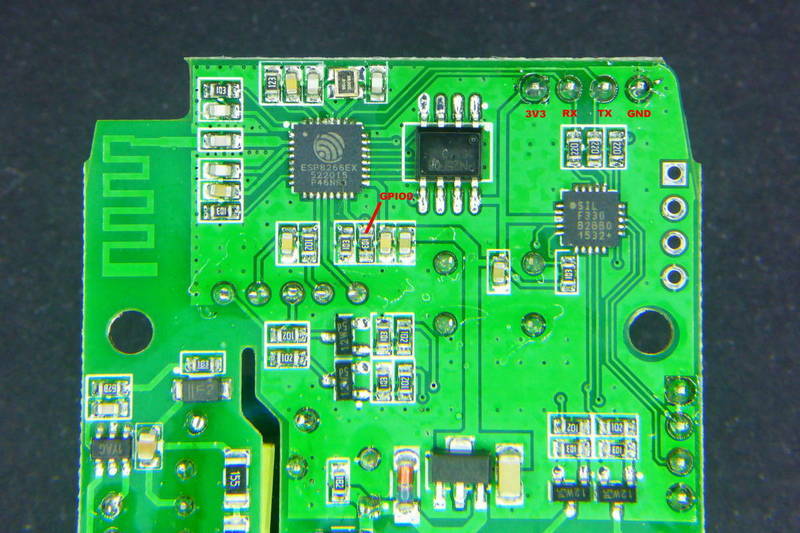 This is regarding the other module, you made mention of – PSB-04 – the 4 channel wifi module ( https://www.itead.cc/smart-home/psb-04.html) Does that one also follow the same protocol as SonoffDual? I mean to ask if the ESPurna works for that module? Anyone tested the protocol? Although that is a standalone module w/o relays and other peripheral sub systems. Thanks for your comments. Now, regarding Sonoff Dual vs PSB-94. 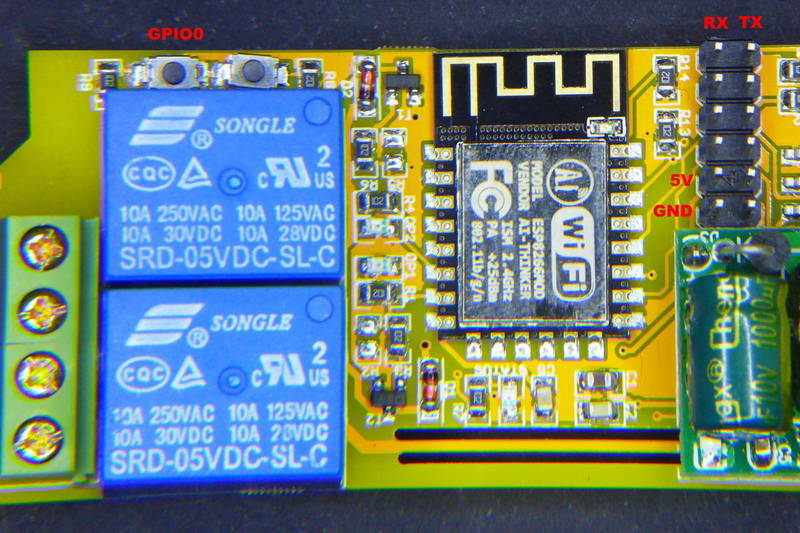 I have some questions about the protocol for sonoff dual which is used between esp and other MCU in sonoff dual . a) Byte 2 as you say is number of relay. Then how come 0x04 is the value for this. Markus does not say anything about number of relays. He simply mentioned that byte no 2 is 0x04 and sonoff dual obviously has two relays and people (perhaps Markus and your code as well is working with byte no2 as 0x04) so I do not get the logic that Byte#2 corresponds to number of relays. If it does then for dual it ought to be 0x02 and for 4 ch modules, it could be 0x04? Or is it max no. of relays this code / firmware works for? b) This is regarding byte#3, Assuming, it is like all bits (4 LSBs) correspond to indivudual relays (as evident from message) then do you think that for relay number 3 and 4 the values ought to be 0x04 and 0x08 , logically OR’ed with other relays ? I tried to order the psb-04: The itead site says it is in stock whereas upon ordering I was told it is on backorder. I wrote to itead but still awaiting the reply. OK, this is mostly guess-work. As you say relays #3 and #4 are OR’ed in byte 3 as 0x04 and 0x08. Since the Dual is a two-relay board you should never see those values. But you do. When you click the button on board you get a 0x04 there. My guess is that the Dual works just like the PSB-04, a 4-relay 4-key board. Relays #1 and #2 are wired, but the physical button in the Dual is wired to key #3, whilst keys #1 and #2 are brought up in a header. Those messages we are seeing are the protocol between the ESP8266Ex and the F330. They are symmetric. Whenever you press a button the F330 toggles the corresponding relay and notifies the ESP with a full status (byte 3 with all active relays to 1). And when the ESP wants to change a relay status it sends a message with the same format to the F330. It’s state-full. Both sides must know the current status to toggle on/off a certain relay while keeping the rest as is (if you want to toggle relay #2 you have to send a current_status ^= 0x02). My guess is that byte 2 is the number of significant bits to take into account. I’m trying to figure out how to use the API. I can get the status of the relay, but how do I set it? $ curl -X PUT -H "Accept: application/json" http://192.1681.1.34/api/relay/0 --data "apikey=C62ED7BE7594B658&value=2"
Hi Xose, nice writeup! Thanks! I’m currently stuck with a project incorporating a Sonoff Dual as an electric blinds control. For that I need the two channels to be mutually exclusive on at any time. When doing this wirelessly, that’s no issue as I can make sure of that in the relay control code, but a problem arises when also using the buttons 0 & 1. I can successfully read the buttons and control the relays accordingly, BUT since the F330 has it’s own idea about controlling the relays when a button press is detected things get a bit messy especially in case of race conditions which makes it rather hard to ensure the mutual exclusivity of channels. Have you got an idea how to prevent the F330 to control the relays on button press but only obey to control commands issued by the ESP8266? You can try to flash the F330. I have not tried it myself. My firmware has the option to force the relays to be in different states but it takes a dime longer to enforce since it’s the ESP8266 commanding the F330 to do so. I wrote a individual program for the F330 and it works fine. You need special programmer because the F330 can not ne programmed via UART. I have choosen the Tool-Stick from Silicon Labs (http://www.silabs.com/products/development-tools/mcu/8-bit/8bit-mcu-accessories/toolstick#getstarted). dear… Find this with google.. I flashed espeasy on the dual. Is there some one that give me a example to switch the two relais? And different GPIO … not working. Only i not get the relais switching..
Hope there is some one that can help me. Please can you show sonoff connections for multiway. 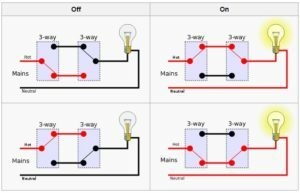 I really didnt understand with pictures of 3 way switching? 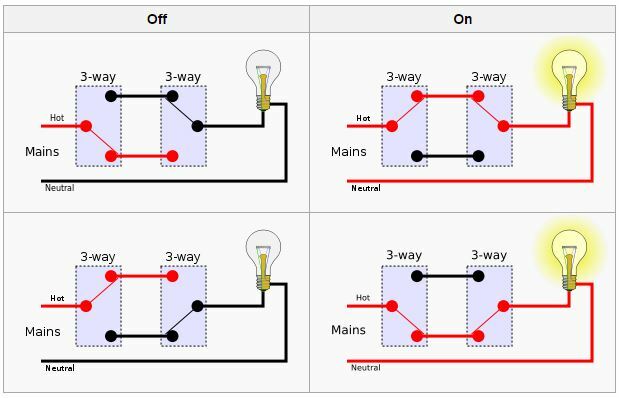 Asli is it possible 4way switching? You can do three-way with two SPST relays like the ones in the Dual. Just connect each of the two lines that go to the other 3-way switch in your system to each relay and select “ONE AND JUST ONE” option in the synchronisation parameter in the web UI (SWITCHES tab). 4-way is not possible with these devices. Hi there! First of all a very big thank you for such a wonderful piece of code. I just discovered it and am looking for ways to use ESPurna instead of my own firmware code. One thing which is coming my way in adopting this is that I currently have my own code on ESP switch and I have integrated it with the normal ON/OFF switches in my home. So instead of the momentarily push button to manually control the switch , I use the regular ON/OFF switch. Seeing your code , you don’t have that mode built in. I tried understanding the code but I think it will be a tough job for me to try modifying it. that’s when I discovered this page where you talk about the “one and only one on” . I am not sure if I understand this. Can you tell me more if what I am looking for can be addressed by this mode OR a way to modify and support the ON/OFF switch instead of momentarily push to ON switch. The “one and only one” sync type is specially suited for 3-way switches when using a 2 relay board. Many of these relays boards use simple SPST relays (or sometimes SPDT but only the NO connection is brought out). 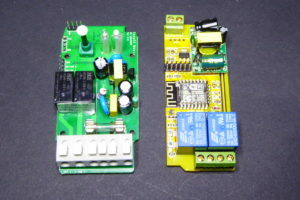 You can then use the board as a 3-way switch by forcing the firmware to always have one of the relays on, and only one. So if you turn relay A on, relay B will go off, and if you turn A off, B will go on again. Aha! I did the change and it works like a charm. Thanks!